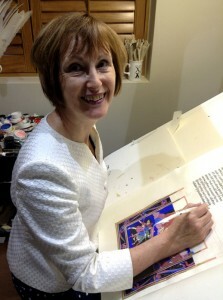 Patricia Lovett is a professional calligrapher and illuminator and works from her studio at Kent. She has written a number of books on calligraphy and illumination, and teaches and lectures all over the world. Letters and words are all around us. We read words in newspapers, on advertisement hoardings, and in handwritten correspondence. They are the way in which we communicate. It is the calligrapher’s job to make these letters and words beautiful. Special occasions and important events are often marked by significant texts. Words from religious books may be read out at a wedding, poems are chosen to celebrate births or anniversaries, and many people have favourite sayings or know extracts from books that particularly appeal. For some people calligraphy means black upright ‘Gothic’ writing on a white or cream background, with perhaps a touch of gold or red. This works with some texts but not all. Calligraphy can bring out the meaning of poetry or prose by the use of colour, by making some words larger and some sections smaller, and even choosing a writing style which suits the feel of the words. To receive or own a hand-made piece of calligraphy is a delight. It shows how much thought for the individual has gone into it, and pieces can be framed and hung on the wall for a lasting reminder of the occasion, the event, or the giver. Of course, printing out those same words on a computer is that much quicker, and cheaper, but it has nothing like the thought and effort of calligraphy, nor the versatility. Calligraphic letters can be matched to a colour scheme in a room, to a favourite colour, or to the meaning of the text. The background too can be coloured and textured. Look at the pieces of calligraphy in Patricia’s gallery to see what can be done.